The SP and BSP have never won the 11 Lok Sabha seats in Uttar Pradesh. However, relying on caste arithmetic, the parties in alliance with RJD is working to win major seats in the state. Lucknow: In the past two decades, Samajwadi Party and Bahujan Samaj Party have failed to win 11 parliamentary seats of Uttar Pradesh, including state capital Lucknow, Varanasi, and Congress bastions of Amethi and Raebareilly. 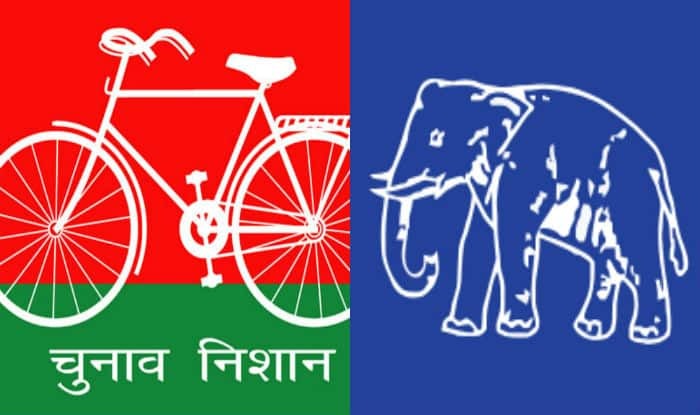 However, relying on caste arithmetic, SP and BSP in alliance with RJD is striving hard to get a maximum number of seats in the state which sends 80 MPs. The Lucknow seat on which the alliance is still indecisive and has not fielded its candidate yet, is BJP’s stronghold. In 1998, 1999 and 2004 the seat was held by former prime minister late Atal Bihari Vajpayee while in 2009 and 2014, the BJP’s Lalji Tondon and Home minister Rajnath Singh had won the seat. Similar is the scenario in Kanpur seat, which was held by Congress’ Sriprakash Jaiswal between 1999-2009 and BJP’s Murli Manohar Joshi in 2014. Varanasi, presently held by Prime Minister Narendra Modi, was won by the BJP’s Murli Manohar Joshi in 2009 while in 2004 it was won by Rajesh Kumar Mishra of Congress and the BJP’s Shankar Prasad Jaiswal in 1999. RLD’s Jayant Chowdhury is in fray from Baghpat against BJP’s Satyapal Singh while in Mathura, RLD’s Kunwar Narendra Singh is challening BJP’s Hema Malini. While Union minister Maneka Gandhi won the seat in 1999, 2004 and 2014, the seat was with her son Varun Gandhi in 2009, who is once again in fray and is challenged by SP’s Hemraj Verma this time. In Bareilly seat also BJP’s candidate and Union Minister Santosh Gangwar is winning continuously since 1999 except in 2009 when he lost to Congress candidate Praveen Singh Aron. Gangwar is once again in the fray and is being challenged by SP’s Bhagwat Sharan Gangwar, minister in previous Akhilesh Yadav government. When asked why SP-BSP could not succeed in these constituencies in past two decades, SP leader and MLC Rajpal Kashyap said, “Nothing can be termed permanent in politics. Situations keep changing. In this LS polls, its the time of alliance and our candidates will win as the situation has changed”. “This time people of the state want to change this ‘jumlebaz’ (gimmick) government at the Centre. Also, as the SP and BSP are contesting together there is no confusion in minds of the people and they will be voting for us to root out the BJP government,” Kashyap said. “In the politically-crucial Uttar Pradesh, there are about 22 per cent Dalits, 45 per cent OBCs and 19 per cent Muslims, whose vote share will be decisive in the general elections this year,” political analyst JP Shukla said.